LS-DYNA® from Livermore Software Technology Corp. (LTSC) is the world's most advanced general-purpose nonlinear finite element program. It is capable of simulating complex real-world problems, and is widely accepted as the premier analysis software package for today's most challenging engineering applications. LS-DYNA can predict how a prototype will respond to real-world events such as crashes, drops, earthquakes, bird strikes and more. The ability to simulate these events in software minimizes the time and expense that must be devoted to experimental testing. Applications of LS-DYNA are numerous, from the simulation of automotive collisions to predicting stresses and deformations in metal forming processes to aerospace bird strike or hail damage on composites with meshless methods (SPH or DEM). Although its street creed is in extreme nonlinear, it is also at home running standard linear solutions for stress, normal modes analysis or advanced PSD fatigue analyses. It is truly an analysis code for all seasons and all terrains. Purchasing LS-DYNA can be as simple as start-up personal license or leasing LS-DYNA on a month-to-month basis. We would welcome the opportunity to work with you on buying LS-DYNA or simply taking it for a test drive. Please feel free to contact us to get started on taking advantage of the world's most powerful and inexpensive complete analysis code. Accurately predict behavior in an automotive collision. Includes specialized features for seatbelts, slip rings, pretensioners, retractors, sensors, accelerometers, airbags and Hybrid III dummy models. LS-DYNA is widely used by the aerospace industry to simulate bird strike, jet engine blade containment and structural failure. Accurately predict stresses and deformations experienced by metal in processes such as stamping, hydroforming, forging and deep drawing. LS-DYNA supports adaptive remeshing and will refine the mesh during the analysis, as necessary, to increase accuracy and save time. LS-DYNA is well optimized on all platforms including multiprocessor platforms (see table below). Its accuracy has been proven through extensive correlation with experimental data and, of course, analytical solutions. LS-DYNA is an invaluable tool for capturing extreme nonlinear events where other solvers have failed. LS-DYNA runs on leading PCs, Unix workstations, supercomputers and MPP (massive parallel processing) machines. Computer resource requirements vary depending on problem size. Simulations with more than 100,000 elements have been run using 15 million words of memory and 100 Mbytes of disk space. On super-computers, the code is highly vectorized and takes advantage of multiple processors. Contact us to get startd with LS-DYNA. We also provide LS-DYNA consulting services. Please feel free to Contact us to discuss your project requiring nonlinear finite element analysis or multiplysics coupling between fluids, heat or magnetism. 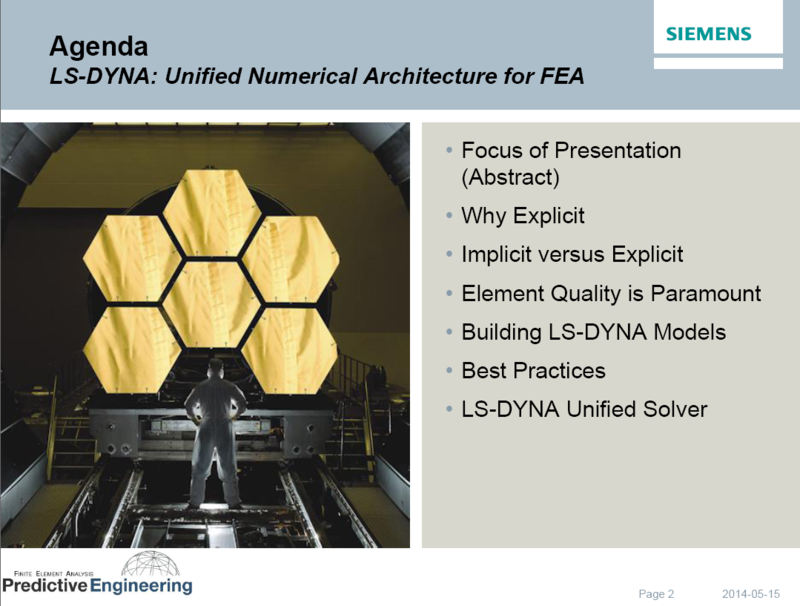 A presentation made by Predictive Engineering on the ease of use of Femap and LS-DYNA.